Net profit of the horticulturist or the premium which the harvested fruits can fetch in the market, entirely depend upon Appearance, Colour and Luster. Rangat is a mixture of Bio-Chemicals designed to enhance the Luster, Color, Appearance. 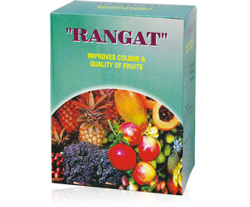 Rangat” is a mixture of biochemicals designed to enhance looks and the colour of the fruits. Excellent results have been obtained on Grapes, Tomato, Mango and Pomegranates, Apple, Banana, Orange, Tomato, Citrus, Beer, Chilies, etc.